24 cm xi, 289 p.
Look around your business. Are your people committed to your goals? Or are they merely complying with them? Imagine how much further you could go if everyone knew where they were going and actually wanted to get there ... It's just common sense that the more committed people are to their work, the more they're going to put in and the more your business will get out. The evidence bears this out: engagement levels predict profitability. But how do you make sure people are on board? 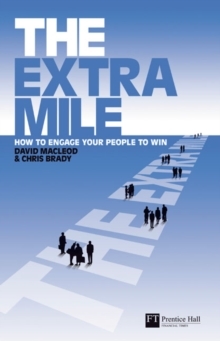 The Extra Mile shows you how to achieve that extra competitive edge by harnessing the commitment of your people, and engaging them with your aims. The Extra Mile is the result of four years of research into engagement by a joint team from Cass Business School and Towers Perrin. This ambitious and wide ranging project drew on the results of various studies and surveys which together totalled 33 million respondents. These hard-hitting statistics were supplemented by more than 50 in-depth interviews with executives and leaders drawn from a variety of business sectors. You will hear from some of them in their own words in this compelling book which distils the results of the research and the interviews into a compelling and engaging read that will make managers think again about how to get their teams to go that all-important extra mile.